The in basket: Jo Clark writes, “Traveling east on Bucklin Hill Road at night I was in a line of cars and saw a flashing light on each side of the road – a new pedestrian crossing at Olson Road. “The first car (I was probably #3 or #4) stopped and a man quickly crossed the road. As soon as he crossed, traffic began to move again, including me, but the light continued to flash even after I passed it. The out basket: These are a fairly new traffic device here, akin to the in-pavement flashers in a crosswalk in downtown Port Orchard, but mounted on a pole. They are designed to call attention to a crosswalk and someone crossing in it. A driver need stop only if there is a pedestrian in or poised to enter the crosswalk, regardless of the flashing lights. The rule is the same as at any crosswalk. The county has put them at the two entrances to South Kitsap Regional Park in South Kitsap, on Central Valley Road at Foster Road, in front of Klahowya Secondary School, where the Clear Creek Trail crosses Bucklin Hill Road and just up the hill at Olson. They don’t flash unless a pedestrian pushes a button to activate them, so it’s not surprising Jo hasn’t noticed any of them. The only time I’ve seen one flash is when I pushed the button myself to test one of those at the SK park. They are set to allow a walker time to travel 3.5 feet per second for the length of the crossing and about three or four seconds are added to either side of the crossing time to ensure pedestrians traffic has stopped for them, Jeff said. So they will keep flashing well after a pedestrian crosses while running or otherwise making fast tracks. The in basket: Patrick Burch of Silverdale e-mailed to say, “The crosswalk on Ridgetop Boulevard at Sid Uhinck has been removed, leaving a VERY dangerous situation to cross Ridgetop. I challenge anyone traveling southwest on Ridgetop to safely AND legally cross Ridgetop without walking all the way down to Myhre Road. “The crosswalk made easy access to the bus stop and entrance to Clear Creek Trails. If you were to cross Ridgetop at the Waaga Way light, you are not allowed to continue southwest on Ridgetop because there is a no crossing sign. If you were to illegally cross there, you would have to take your life in your hands and dodge cars exiting Waaga Way onto Ridgetop. “Walking all the way down to Myhre is totally unacceptable and will not be made by many individuals. Pedestrians will be forced to play dodge ball with the cars. Back last winter, while the crosswalk was still there, Ronine Riggins proposed making lane changes approaching that crosswalk illegal, lest a driver looking back to see if it were clear for a lane change might not see a pedestrian in the crosswalk. The out basket: Jacques Dean, the county’s construction manager, says, “The crosswalk will be replaced at a location near the west side SR 303 off/on ramp. The old crossing was removed, as were the sidewalk ramps that existed on both sides of the crossing. The new location should eliminate the danger Ronine saw. The in basket: The proper response by a driver to a pedestrian trying to cross the street is a subject that I’ve pondered for many a year. The fact that the law requires something of a driver that I, when a pedestrian, don’t necessarily want helped propel my curiosity. By that I mean that quite often I prefer to wait for a car to pass before starting across, because if there are no cars behind that one, I can cross at leisure, rather than hurrying across to minimize the driver’s delay. But the law usually requires him or her to stop if I’m poised at the curb. In time, I have come to know that any intersection is a crosswalk, whether striped as one or not, and a driver is required to stop for anyone walking across the street. But as I watched people stepping into a crosswalk on the other side of a multi-lane road or street, I came to wonder if I have to stop immediately. So on a three- or four-lane street or road, is it legal to wait until the pedestrian steps into the lane closest to the one I’m in. Can I proceed even though the pedestrian is in the crosswalk, but more than a lane away from mine? The out basket: I asked Police Chief Geoff Marti in Port Orchard, Lt. Pete Fisher of Bremerton police and Trooper Russ Winger of the State Patrol here, and they agree that that is the logical meaning of the law. 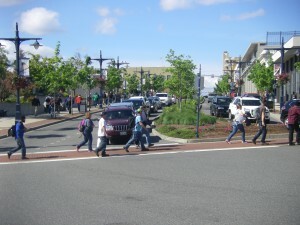 So when I approach that crosswalk in downtown Port Orchard with the pedestrian activated flashing lights in the crosswalk, for example, and the walker is on the opposite curb, can I proceed until he or she is stepping into the center lane, I asked Geoff. “Yes, that would be my interpretation,:” he replied. The same is true if the pedestrian has crossed in front of you from your side of the street. You must wait only until he or she is leaving the intervening lane before proceeding. In real life, of course, not stopping before you legally have to may intimidate a pedestrian into not starting across, especially if there is no protective island in the middle. As a matter of consideration, it still might be best to stop when the walker enters the street, no matter now wide, but you don’t have to if there is one or more lanes between you. The in basket: Christopher Mutchler, a Kitsap Lake native who has established his accounting business there, says there is a serious need for a crosswalk across Kitsap Way in their business district. 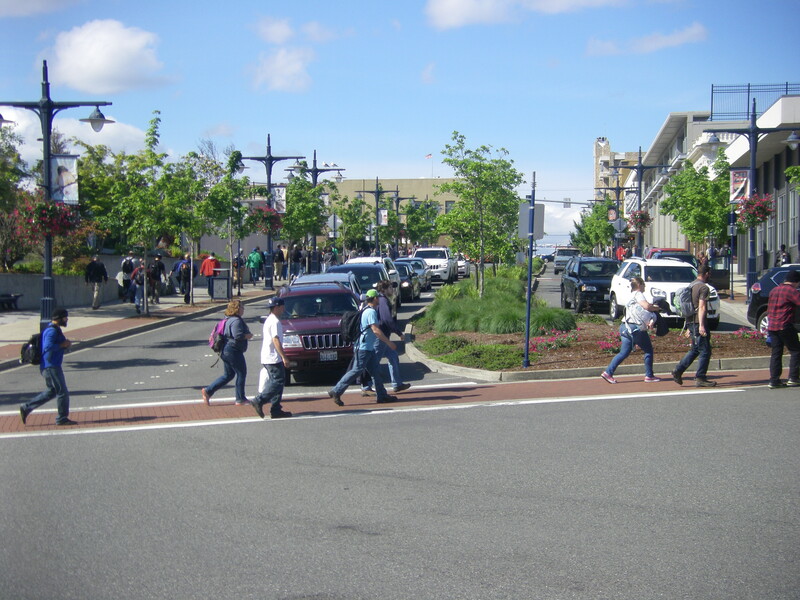 Kitsap Way,” he said, “Some time later, the crosswalk was moved to between Fire One Protection and Novak Gutters. “Now, no crosswalk. When I researched locating here last December, I was informed by the city that nearly 10,000 cars pass this direction each day. Why no crosswalk now? He said he got the impression from the mayor in a July meeting with business owners at Kitsap Lake that it could be done, but he’s heard nothing since. The out basket: The city very much appreciates the offer, says Street Engineer Gunnar Fridriksson, but must turn it down. As with plans to upgrade the crosswalk at First Street and Highway 304, discussed in a recent Road Warrior column, plans for the Kitsap Lake crosswalk are detailed in what’s called the Non-Motorized Plan. It shows the crossing at the north side of the Harlow Drive intersection, and calls for pedestrian activated signage and a raised area half-way across for a pedestrian refuge. It appears to also involve sidewalks with more definitive breaks for driveways. When, of course, depends on acquiring money to get it done.